Approximately close to 3 AM Sunday, I heard multiple gun shots when I was in my room and about ready to go to bed. I lost count but there was definitely a series of gun shots and my guess would be around 6 shots or more. It sounded to good to be true for something else but gun shots with regular interval in between shots. I went outside and saw police immediately came by the bunch and block Georgia Avenue between Park Rd NW and Newton PL NW. The crime victim was seen on the ground few feet away from the Laundromat on Georgia Avenue and Park Road. Units received a call for sounds of gunshots shortly after 3 am and during the canvass located an unconscious adult male suffering from an apparent gunshot wound at Ga Ave and Park Road, NW. The male is deceased. 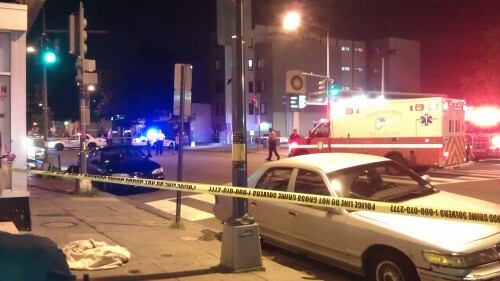 The 3400-3500 blks of Ga Ave are temporarily closed while the investigation continues. This case is being investigated by the Homicide Branch. Anyone with information is asked to call 202-727-9099.